Michael Rhoades is a multi-oriented artist. This web site functions as a central repository for his vast repertoire in the form of representations of most of his work. From photographs of his vibrant oil paintings to mp3 versions of his multi-channel hi-res musical compositions to YouTube versions of his Visual Music compositions, to theoretical writings on creativity, metaphysics and more. You will find much here to delve into if you so choose. So many exciting things are manifesting here at the Perception Factory. As always the focus is upon contributing to the expansion of human consciousness. Below are a few points of interest… Check them out! October 2018 – Michael’s visual music composition “Reflections and Refractions” was be presented as a part of Electronic Music Midwest 2018, which was hosted at Lewis University… just south of Chicago. August 10th, 11th, and 12th, 2018, – Michael’s musical composition “A Hot Jupiter” was a presented in three concerts that were a part of CubeFest 2018. The concerts, called “Sounds in Focus”, took place in the Perform Studio at Virginia Tech. July 21st, 2018, – Michael’s “Crystal Verse”, a visual music composition, was presented at 2018 NYCEMF, which was held in Manhattan, New York City. The festival took place at the Abrons Art Center at 8PM. April 30th, 2018, – Michael’s “Second Body Awareness”, a holographic/holophonic visual music installation, was presented in the Cube, in the Moss Art Center at Virginia Tech, as a part of ICAT Day. April 30th, 2018, – Michael’s “Ice Cube Windows”, a projection mapping composition, was presented as a part of a group exhibit during ICAT day. It took place on the west side of the exterior of the Moss Art Center at Virginia Tech. The show began at dusk. 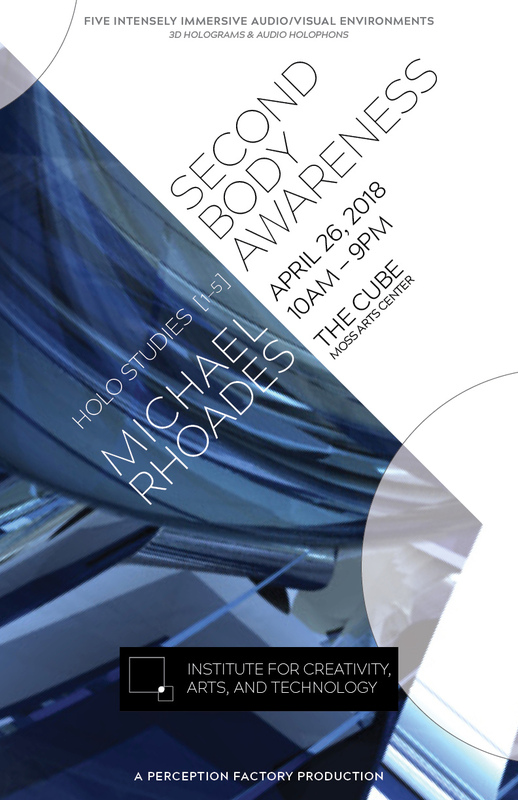 April 26th, 2018, – Michael’s “Second Body Awareness”, a holographic/holophonic visual music installation, was presented in the Cube, in the Moss Art Center at Virginia Tech. It was be a day-long installation that began at 9:00 am and ended at 9:00 pm. 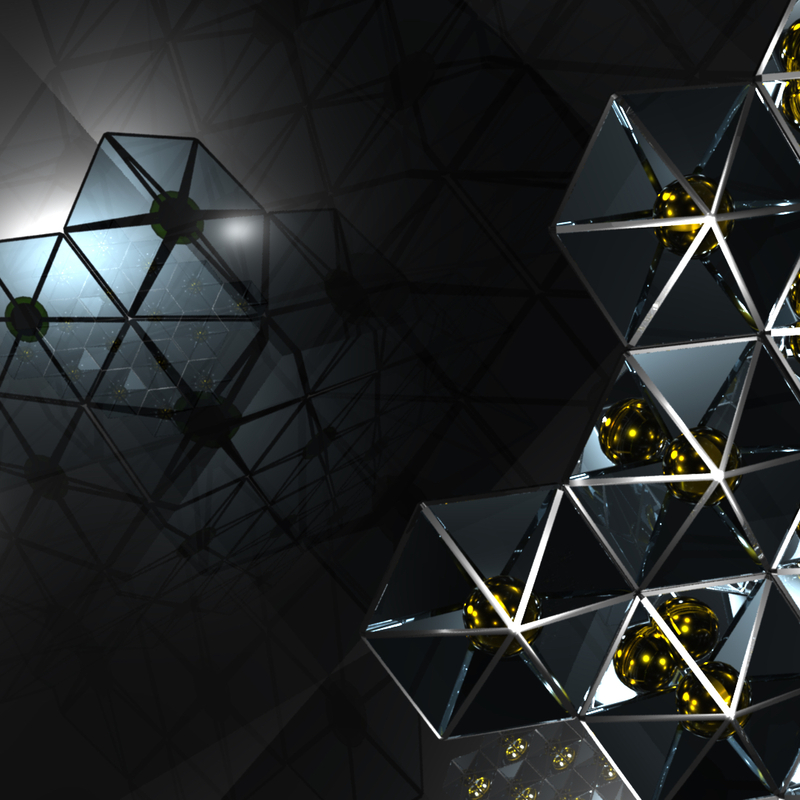 Here is a 2D version of the composition. Here is a low res version of the motion graphics poster for the event. Here is the paper poster for it. October 6th, 2017, Michael’s Visual Music composition “Apparitions” was presented in Germany at the Festival NEUE MUSIK LÜNEBURG. The name of the concert was: Elektroakustische Musik aus New York City. September 30th, 2017, Michael’s 8-channel composition “Second Body Awareness” was presented at the International Csound Conference, ICSC, which took place in Montevideo, Uruguay from September 29 – October 1. The conference was hosted by Estudio de Música Electroacústica de la Escuela Universitaria de Música — University School of Music Electronic Music Studio. June 24th, 2017, Michael’s Visual Music composition “Apparitions” was presented in New York City at the New York City Electroacoustic Music Festival. The international festival took place at the Abrons Art Center. December 7th, 2016, Michael’s latest Visual Music piece, “Pixelated Planes” was presented at the Fall DISIS concert, in the Cube at Virginia Tech. October 14th, 2016, Michael presented an exhibit/concert in the Cube in the Moss Art Center at Virginia Tech. The event was titled “Imagined Realities” and was based upon the notion that we are creating the realities we are experiencing. It consisted of: An exhibit of 10 new 60″ x 48″ oil paintings completed during the summer of 2016, 3 fixed media (music only) compositions, and 3 Visual Music animated compositions. The oil paintings were exhibited throughout the entire day in the lobby of the Cube. The music was diffused over the ~150 speakers in the Cube creating an awesome 3d musical environment. The visual work was projected upon a huge screen. Here is the Concert Flyer. June 18th, 2016, Michael’s Visual Music composition “Reflections and Refractions” was presented at the New York City Electroacoustic Music Festival. The concert was presented in the Playhouse at the Abrams Art Center at 8:30 PM.